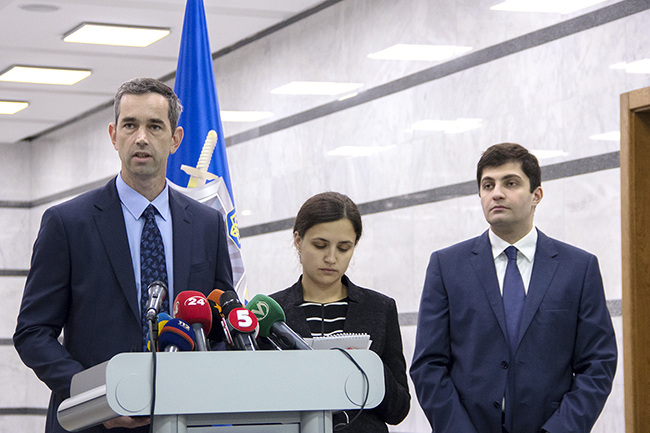 Today Head of Administration of Justice Advisory Unit of the European Union Advisory Mission Robert Boer participated in the briefing of Deputy General Prosecutor David Sakvarelidze. The briefing was dedicated to the first stage of the recruitment of the new heads of local prosecution offices – testing knowledge of the Ukrainian legislation. “The European Union Advisory Mission is a strong supporter of the reforms in General Prosecutor’s Office. We have been working together with GPO in developing the procedure for the testing process that is starting tomorrow in 5 centers across Ukraine. In line with EU standards, this testing will be done in an open and transparent manner to guarantee that the new local prosecutor’s office will get the best people managing these new offices. In order to ensure that every candidate gets a fair chance and that the process is indeed open and transparent and according to the agreed regulations, mission will together with General Prosecutor’s Office and the non-governmental organization OPORA deploy observation teams to all testing centers. EUAM will continue to support and assist the General Prosecutor’s Office in its desire for changes as these reforms are crucial for the overall reforms, especially in the justice sector,” — Robert said. European Union Advisory Mission supports the reform of General Prosecutor’s Office since its beginning. Mission has already provided advice and expertise on internal investigations, vetting, and communication and will continue cooperation in the future.